Sir Richard Branson and his Virgin Galactic company is footing the bill on development of the WhiteKnightTwo/SpaceShipTwo space launch system. DUBAI, United Arab Emirates ? The presidentof the most prominent company developing a space tourism business on March 3applauded legislation signed into law in New Mexico that reduces the risk thatspace tourism operators will face crippling lawsuits brought by survivingfamily members of a participant injured or killed during flight. VirginGalactic President Will Whitehorn said the legislation, signed into lawFeb. 27 by New Mexico Gov. Bill Richardson, will help place the emerging spacetourism business on the same footing as tour operators leading expeditions toMt. Everest. "This helps give us a really solid insurancefoundation" for the business, Whitehorn told the World Space Risk Forumhere. "It includes the principle of informed consent. Participants will berequired to sign a waiver before flight." Insurance has long been considered one of theleast exciting, but most problematic, hurdles that the space tourism industryfaces. Customers at least in the early years are likely to be high-net-worthindividuals, many of them still professionally active. The threat that a fatalaccident could result in a multimillion-dollar award has been shadowing thespace tourism business since the beginning. Vanessa Leigh, who is with the specialistaerospace law firm Gates and Partners of London, said even the strongestlegislation will not immunize the industry against future challenges fromcourts, as has proved to be the case with civil aviation. "The [space tourism industry] may dreamof something like the 1929 Warsaw Convention, but it isn't going to happen,"Leigh told the conference, referring to the pact that sets limits on liabilityfor passenger transport and helped permit the commercial aviation industry to expand. But the New Mexico law, called the SpaceFlight Informed Consent Act, is intended to set barriers to future insuranceclaims that could render the space tourism industry uninsurable and thus, forall practical purposes, stillborn. The law stipulates that spaceflight operatorscannot be held liable for the "death of a participant resulting from theinherent risks of space flight activities" so long as participants signa waiver before the flight. The waiver reads in part: "I understandand acknowledge that under New Mexico law, there is no liability for injury toor death sustained by a participant in a space flight activity provided by aspace flight entity if the injury or death results from the inherent risks ofthe space flight activity. Injuries caused by the inherent risks of spaceflight activities may include, among others, death, bodily injury, emotionalinjury or property damage. I assume all risk of participating in this spaceflight activity." The waiver does not hold in the event the spacetourism operator is found guilty of gross negligence or willful misconduct. Steve Landeene, executive director of LasCruces, N.M.-based Spaceport America, said in a March 1 statement that the law'spassage "was critical to the success of Spaceport America and our abilityto attract and retain commercial space companies to New Mexico." Virgin Galactic plans to operate suborbitalspace tourism flights out of the New Mexico spaceport. The law covers only New Mexican airspace andwill not apply to flights departing from one point and landing at another ? abusiness Whitehorn said will take many years, and more legislativedevelopments, to develop. The Commercial Space Launch Amendments Act of2004 (H.R. 5382) in 2004 established initial guidelines for space tourismoperators intended to give them room to develop. The U.S. Federal AviationAdministration's Office of Commercial Space Transportation, which isresponsible for licensing space launches, refers to customers as "participants"rather than passengers, reinforcing the idea that they are presumed tounderstand the risks of the endeavor. Virgin Galactic, Whitehorn said, will own andoperate the SpaceShipTwovehicle and its mother ship, WhiteKnightTwo, which will carry passengers tothe edge of the atmosphere. It remains unclear whether all the program'sindustrial subcontractors will sign cross-waivers with Virgin Galactic withrespect to responsibility for their components. Nearly 330 people have made deposits totaling$45 million to reserve flights with Virgin Galactic, Whitehorn said. A certainnumber of them have asked to fly on the demonstration flights, displaying anappetite for risk that was not shared by the insurance underwriters, satellitebuilders, satellite operators and others attending the space-risk forum here.In a poll, more than 60 percent of the attendees said they would not sign upbefore at least six successful flights were undertaken. 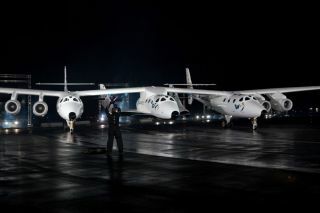 Whitehorn said the SpaceShipTwo vehicledesigned by Scaled Composites LLC of Mojave, Calif., is nearing completion ofground tests and will be put through a series of drop-and-glide tests in thecoming months before powered flight tests begin in 2011. The Spaceport Americarunway is scheduled to be inaugurated in October.